Twenty promising athletes uncovered by Zwift’s Talent ID now pursuing seats on professional cycling teams CANYON//SRAM Racing & Team Dimension Data. Zwift, the global online fitness platform for cyclists, has seen its first round of 2018 graduates emerge from the Zwift Academy to move closer to a professional cycling contract with top ranked men’s and women’s teams. The 20 semi-finalists, 10 under-23 men and 10 women from around the world, completed a structured program of group rides, races, and workouts over a eight week period, exclusively in the online cycling environment of Zwift. Starting 15th October these 20 athletes will continue to the next round of cycling tests to determine who will advance to the finals at their potential team camps. All Zwifters will be able to follow the journey of the semi-finalists and complete the semi-final workouts themselves. The Zwift workout sessions will be made available in game from later this month. This year has seen 5,000 women take part in the CANYON//SRAM Racing | Zwift Academy, over double the number of participants from 2018. For many, the Academy provides a great opportunity to take part in a social global online training camp - completing the 10 Workouts, Four Group Rides and Two Races is an achievement in itself. However, for a select few, the Academy is a unique opportunity to achieve a professional contract at the sport’s highest level. Last year’s winner, Tanja Erath has just finished a hugely successful season with the CANYON//SRAM World Tour team. Her first season saw her play an important role in races such as the Tour de Yorkshire and she even tasted success, wearing the sprinters jersey at the Tour Cycliste Féminin International de l'Ardèche, she took silver in scratch race at the German National Track Championships and also represented her country at the Lotto Belgium Tour. The 10 semi-finalists from the Team Dimension Data​ | Zwift Academy emerged from a staggering crop of 30,000 cyclists from across the globe. These riders will now compete to win one of three places at the Team Dimension Data training camp in South Africa, and ultimately a a professional contract with their U23 development squad. 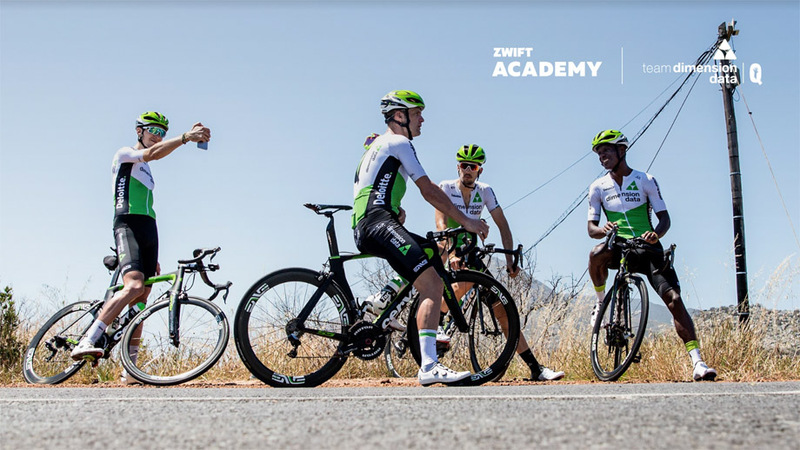 CANYON//SRAM Racing | Zwift Academy riders will receive Wahoo KICKR trainers and Rapha kit while the Team Dimension Data | Zwift Academy Semi-Finalists will each receive Elite Direto smart trainers. In addition all twenty semi-finalists will receive SoleStar KONTROL cycling insoles. Following the end of the semi-finals, twenty will become six. These six finalists (three from each program) will travel to their respective week-long team camps in Cape Town, South Africa and Malaga, Spain to ride and complete structured drills with their prospective teams after which, two professional contracts will be awarded. Zwift is a company of dedicated fitness enthusiasts that also happen to be experienced software and video game developers. Combining that passion and deep understanding of the fitness world, Zwift is the first company to use massive multiplayer gaming technology to bring the outdoor experience indoors. Athletes from around the globe can train and compete with each other in rich, 3D-generated worlds simply by connecting their existing devices & hardware (e.g. cycle trainers, power meters, treadmills heart rate monitors, etc) wirelessly via open industry standard ANT+ and BLE. From friendly competition, to racing & structured training programs, Zwift is building a community of like-minded athletes united in the pursuit of a better social fitness experience. Launched in 2016, CANYON//SRAM Racing is a professional women's cycling team racing at the UCI Women's WorldTour level. From the solid foundation of experienced riders to the go-getting attitude of the younger riders, this diverse group of women seem to feed off and inspire each other. 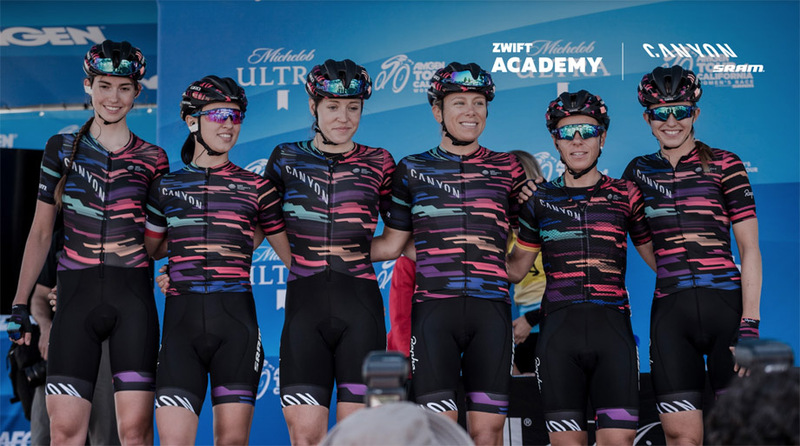 With a team motto of ‘better together’ when they are aligned they are part of something special, and even more extraordinary, these women create something special to watch.They generate a momentum and atmosphere that is unique to CANYON//SRAM Racing. They promote women’s professional cycling, they inspire people to ride all around the globe, and they are committed to delivering incredible stories.​ ​http://www.wmncycling.com. Qhubeka’s mission is to move people forward with bicycles. “Qhubeka” is an Nguni word that means “to progress,” and, with a bicycle, a person can travel faster, and move further, and carry more, whether it’s to a job, a school, a clinic, or a place of clean water and abundant food. The bicycles we provide also have a crucial role in initial emergency response for disaster relief. Based in South Africa, but operating across the entire African continent, children and adults in rural communities earn our Buffalo Bikes through our Learn-To-Earn and Work-To-Earn programs, moving them forward towards a more secure and richer life. Team Dimension Data for Qhubeka is Africa’s first ever UCI World Tour team, starting its first season in 2016. After three successful years in the Pro Continental ranks, the team has enjoyed considerable success as a World Tour team, competing at the highest levels of the sport. Team Dimension Data for Qhubeka continues to operate a U23 Continental team as well, nurturing junior talent and developing the World Tour team’s future athletes. The Qhubeka project remains at the core of our setup and the very reason why our team exists. Team Dimension Data creates a platform for awareness about Qhubeka and garners international support for the project, so that Qhubeka may continue to mobilize the African people, giving the team a sense of purpose beyond competition. Team Dimension Data wholeheartedly believes in the #BicyclesChangeLives campaign and that it will remain a driving force behind our success.